Meet Jinx, the Luckiest Black Cat!Meet Jinx, the Luckiest Black Cat! Meet Jinx, the Luckiest Black Cat! Story Jinx came into our family awhile ago as a 4 week old kitten. His mother lived under our shed with a skunk who we think helped mother the litter of kittens. One day we opened the shed to find 3 kittens running around! We went to catch them, and we were able to rescue one little kitten, although we did get a few scratches! We put him in a box and brought him into the house. 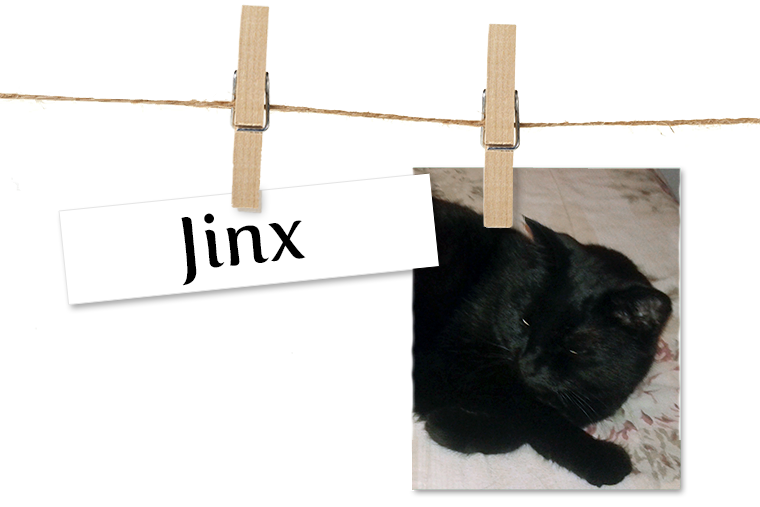 We thought of names all day and Jinx just seemed to fit! Jinx stunk of skunk so we bathed him in coffee to help with the smell. Since he was a feral kitten he learned pretty quick that humans meant him no harm. Now Jinx is a 20 pound cat living the luxury life of chasing mice and being spoiled!